Purdue University president France Córdova holds a press conference in January. She delivered her final "State of the University" address Tuesday. Outgoing Purdue president France Córdova used her final State of the University address Tuesday to outline an ambitious agenda for her final months on the job, WBAA reports. “We’ll adapt to the revenue challenges and the technology challenges of the future, but we’ll not lose sight of our higher purpose, which is higher education,” Córdova said in her speech. 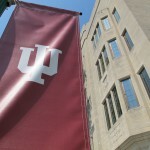 Córdova highlighted Purdue’s “Decadal Plan” as a road map forward for the university. Earlier this year, Córdova announced one of the more noteworthy outgrowths of that strategic-planning process to date: the transition to a trimester system. The change will beef up summer semester course offerings to make them closer to co-equal with the fall and spring semesters by 2022. Córdova — the first woman to hold the top job at Purdue — told WBAA’s Sam Klemet that she’s mindful of the challenges facing the university as she prepares to depart this summer. “I don’t think we can ignore them, and the more sensitive we are to what people are asking of higher education — which is to, simply, change — the better position we’ll be,” she said. A search committee is in the process of finding Córdova’s replacement.